A sensor analyzes faces in terms of their geometry and the reflectance of different regions of the skin. 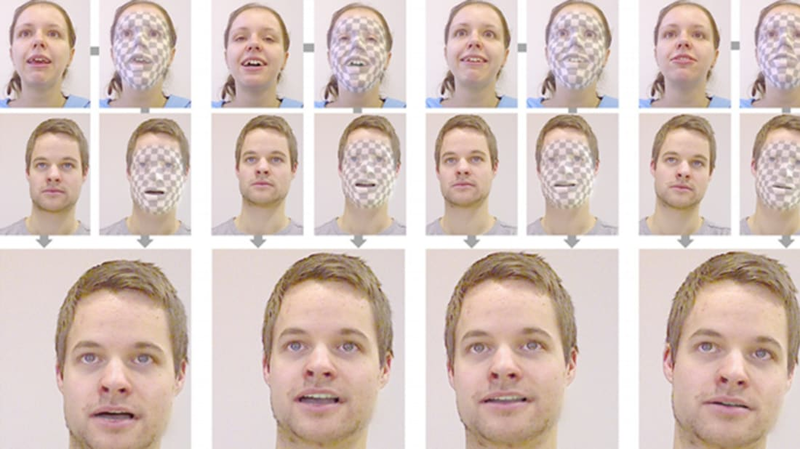 Essentially, it creates virtual models of the faces of both participants and the lighting in the video, so that the facial expression of one person can be pasted over the face of another. The technology computes the difference between the first person’s expression and the target's face, and renders them together. The goal is to only manipulate the parts of the face necessary for that particular facial expression, rather than changing the target’s entire face. Imagine a multilingual video-conferencing setup in which the video of one participant could be altered in real time to photo-realistically reenact the facial expression and mouth motion of a real-time translator. Or imagine another setting in which you could reenact a professionally captured video of somebody in business attire with a new realtime face capture of yourself sitting in casual clothing on your sofa. Plus, the prank possibilities seem endless. Imagine if SNL could transfer Kate McKinnon’s facial expressions onto what looks like Hillary Clinton’s actual face.